Here is a recreation of a cardboard point-of-sale poster that was sold on Trade Me a few years back, and I have redrawn it from a photograph that accompanied the auction at that time. 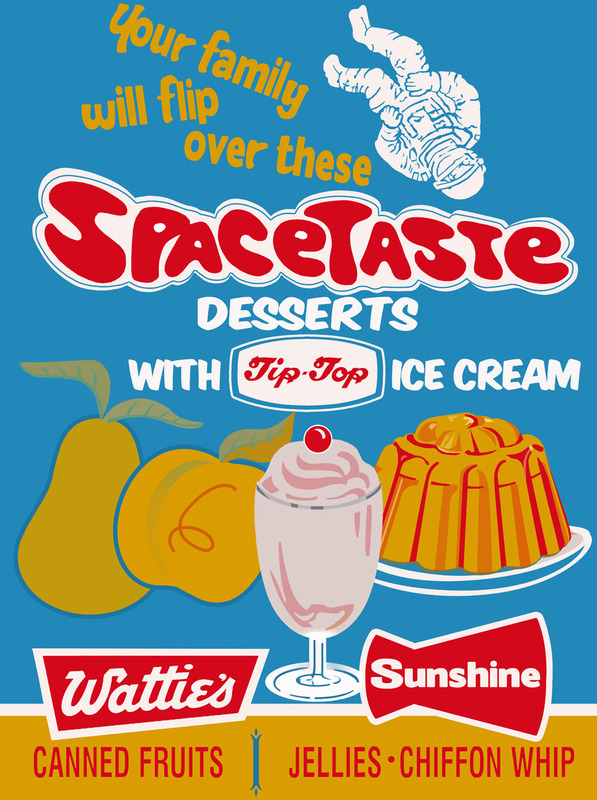 I suppose it was intended to give housewives dessert ideas – hopefully prompted by kids pulled in by the space theme; a popular mode of advertising that more or less took over from aviation to up-sell everything from jelly to drinks to cereals, in the second half of the 20th century. I started this a couple of years back and it was when I was just changing over to using vector-based graphics so it’s a bit raggedy compared to my usual standard. I’m taking a guess that this poster dates from around the mid 1970s, given what I know of the brands, products and logos – but mostly indicated by the font styles. Here we have three of New Zealand’s most enormous brands of the time – together in one advertisement, bouncing off each other in a friendly joust. 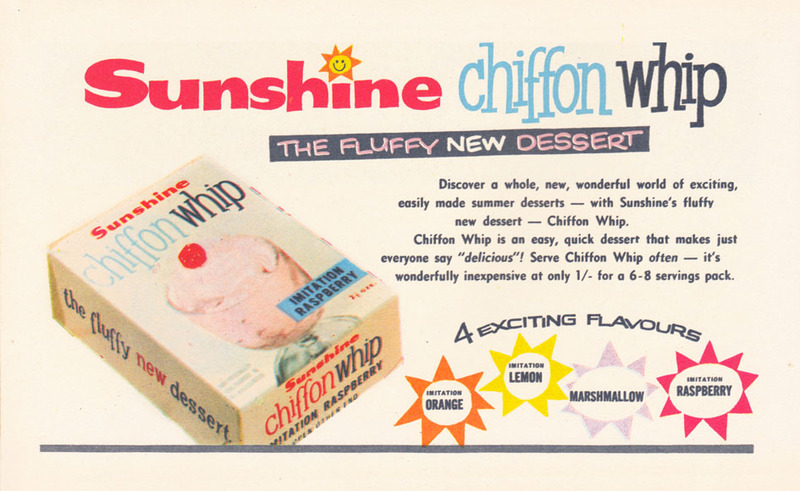 Advert for Chiffon Whip, 1963. The product was two years old at this point, and lasted well into the 1970s. 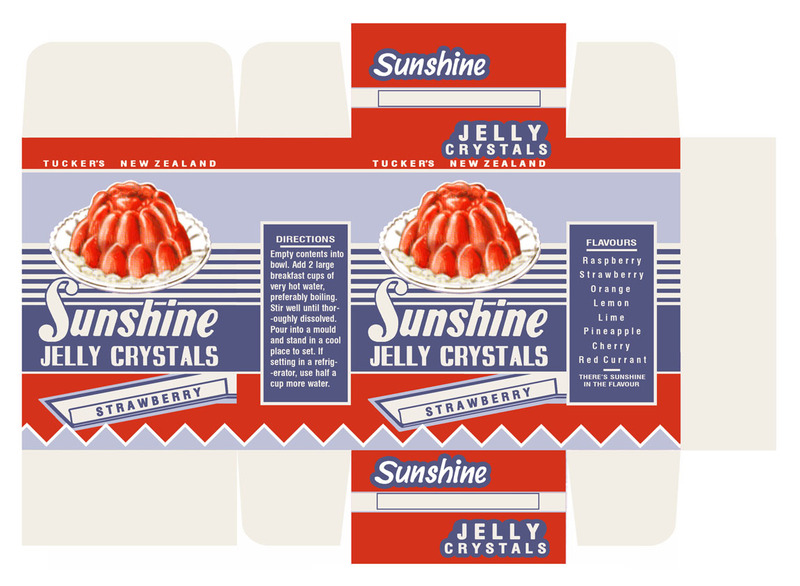 I’ve previously written briefly on the Sunshine brand here, and recreated jelly crystal boxes here, and here. It was an Auckland-based company owned by W.F. Tucker – and in particular baby boomers will remember Sunshine well for their custard powder, jelly crystals and peanut butter which were very popular through the 1940s to the 1970s – although the company were around a lot longer than that and started using the Sunshine name as far back as the 1910s. The company did a variety of instant desserts and Chiffon Whip was launched in 1961 in flavours lemon, orange, raspberry, and eventually marshmallow. 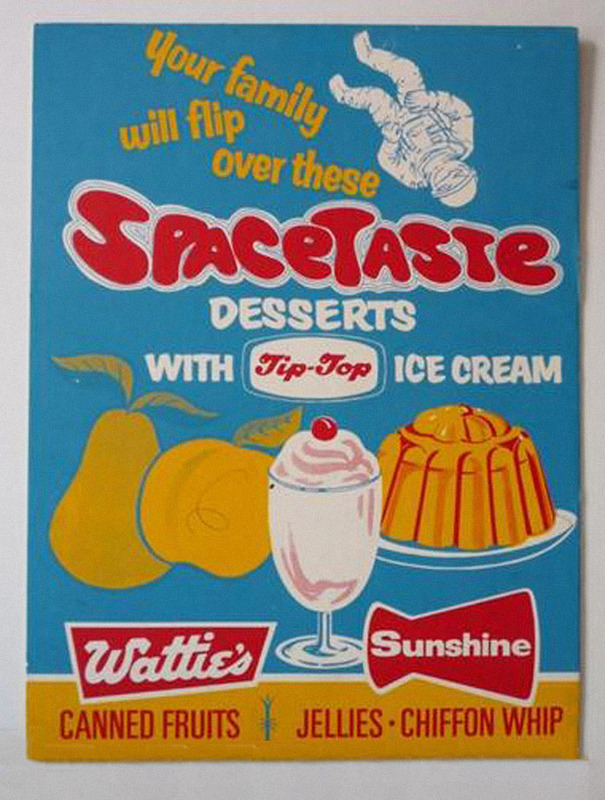 This Watties design was on the shelves in the early-mid 1960s. What else is there to say about Wattie’s? I know I’ve done more than several posts, such as fruit-related ones here, here, and here…and I keep saying I am going to get around to some kind of feature on what is probably Aotearoa’s biggest brand of all time. But lately I’ve been thinking …do I really need to? Books have been written and I’m not sure I have anything to add. It would depend on any new information I can scrape up. And quite frankly, looking at the archives there just may not be a lot of that – given that Wattie’s seemed to feel no need to advertise their wares or have any of their business reported on, until well after WWII, when part and full page ads for the product start to appear (I suspect their major contracts with the government suddenly ending had some bearing on this change). Apparently until that point they were so successful so quickly there was no reason to do so. Anyway, it’s a daunting task to consider writing a full article on this topic, and I guess if somebody really wants to know all about it – they could buy Geoff Conley’s book (1984) which is not that hard to find to this day. The original picture I redrew the poster from. I have had a story half -prepped on Tip-Top for ages but again it’s a tall mountain to climb. However I feel there’s a lot of things that need to be set straight and expanded on. The most detailed article I have seen on the brand was a fairly brief and pretty stock standard issue from the PR department on the 75th anniversary of the brand, for one of those weekend-type magazines like Canvas – and I think quite inadequate given the iconic status of the product – and the archive of material they have at their disposal. 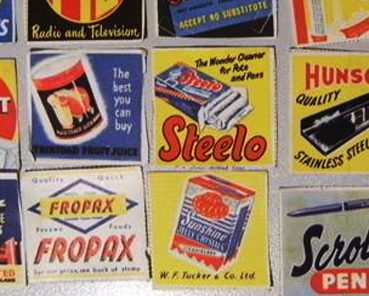 Tip-Top tin signage manufactured for dairies of the 1960s. That’s all from me for this week. Come July it will be difficult to focus on this blog as I’ll be back to studying however you can expect briefer, probably picture-based stories and maybe some longer ones if I have time to finish up on them – the James Smith Ltd department store, Aulsebrook’s, commercial artists Alison Fyfe and Bernard Roundhill, and a couple of amazing caches of retro advertising and packaging stuff that have recently been found around the country. I previously wrote about “Big Swap” coupons here in September 2011. Finally I was able to purchase my own set a couple of weeks ago, after missing out numerous times over the past five years – and get a really good look at them. 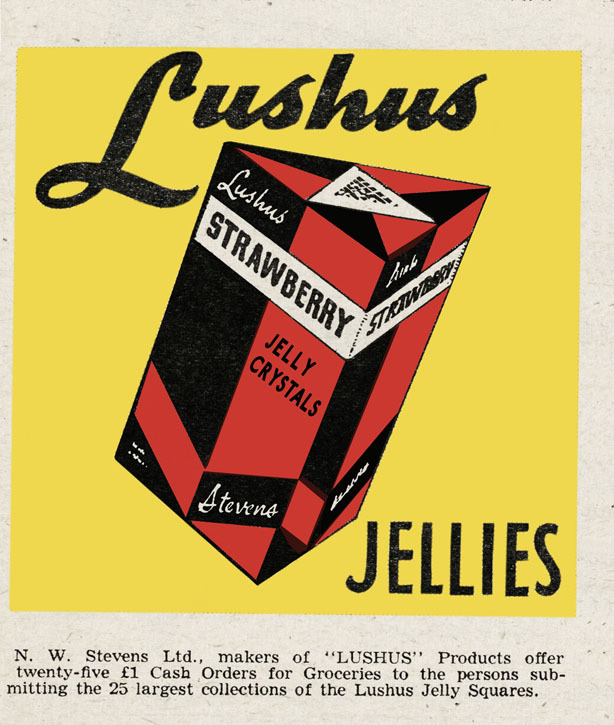 I didn’t realize that the Lushus Jelly coupon was missing from the set when I bought them until I was about to post – so I had to quickly recreate the artwork for it to match the rest of them. 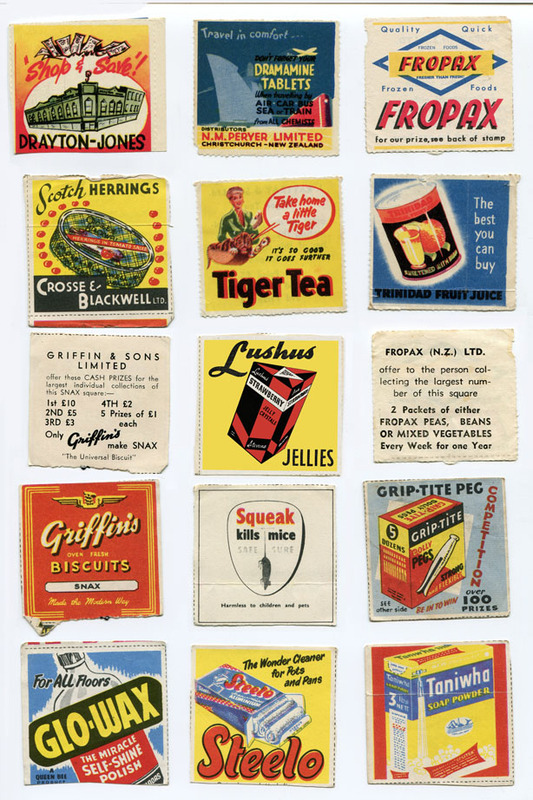 There’s some products that have become classics in the time that has lapsed over the decades (such as Griffin’s biscuits) and also some I have never seen before . Trinidad Juice was a new one for me. It appears that it’s still going – a Trinidad and Tobago-based brand that was launched in 1930. I can’t find any information on Linella at all – perhaps it was their one and only product and disappeared off the market after a few years. 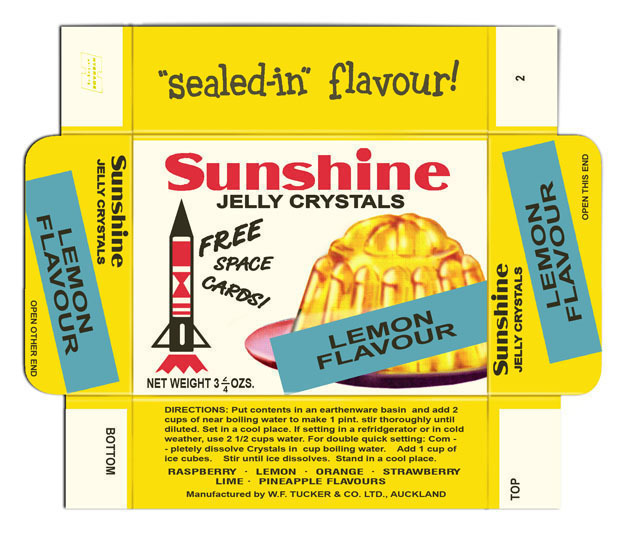 Linnell & Co Ltd were a Hawera-based company and the product, containing butter and eggs – was essentially that Antipodean classic lemon cheese, except Linella came in Orange and Banana flavours as well as Lemon Delight. That’s all I know. It’s possible the “Big Swap” competition was the promotional brainchild of mail order company H H Brandon, but not entirely – as squinting I can make out that the endeavour was sponsored by “The Auckland Public Relations Office” (office of what it doesn’t specify). 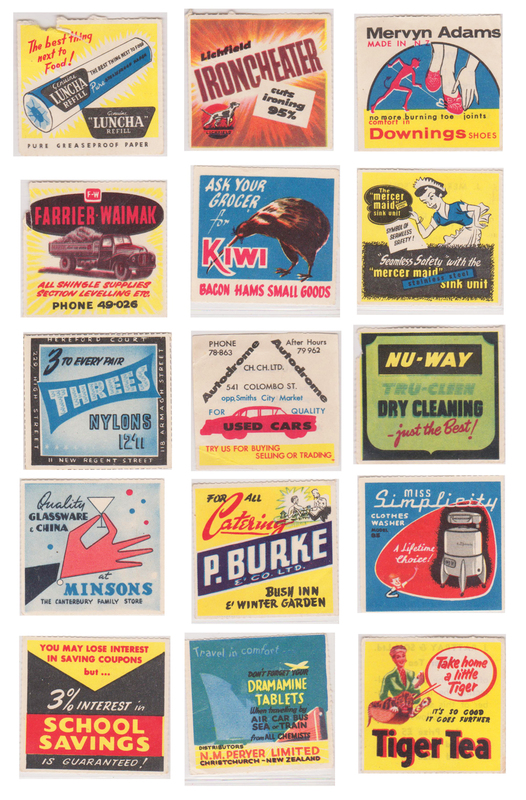 Previously I stated that these were “Big Swap” coupons from 1954, but in fact when I take a closer look at these and compare them to what’s in the Alexander Turnbull manuscript and pictorial and collection – they may not be. Some of mine are the same (Steelo, Sellotape, Lushus, Taniwha) as the “Big Swap” set, and some are different (Berger, Kiwi, Gilbey’s). So I am afraid that what I wrote previously may be incorrect – it seems upon closer examination the ones I have purchased may not be the same, they were possibly called “Woppa Swappa”, and were issued for a similar competition. 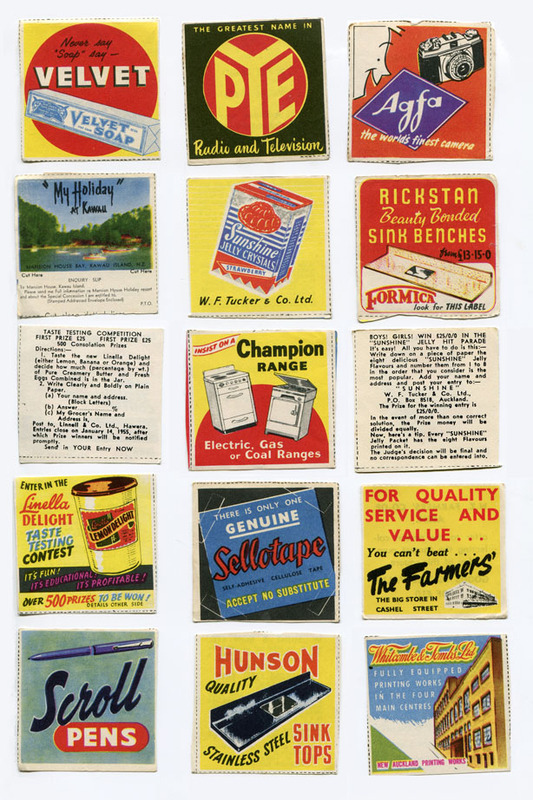 Linnell states on the back of their advertising coupon, a competition for their company closing on the date January 14, 1955 – so that pretty much solves the mystery about any dates – they must have been issued later the same year as the “Big Swap” competition. It will be interesting to see if any other versions turn up. 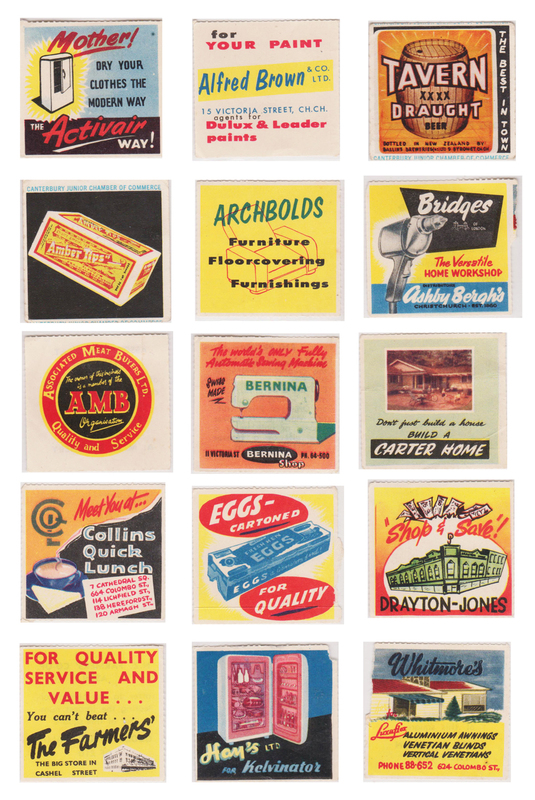 Still, it’s a nice little snapshot of some of the household products of the time. Addendum mid Jan 2014: A Dunedin collector and reader of this blog kindly sent these images to me as a contribution the article. These arrived some months ago and I haven’t had time for quite a while to do all the updates I need to get around to. 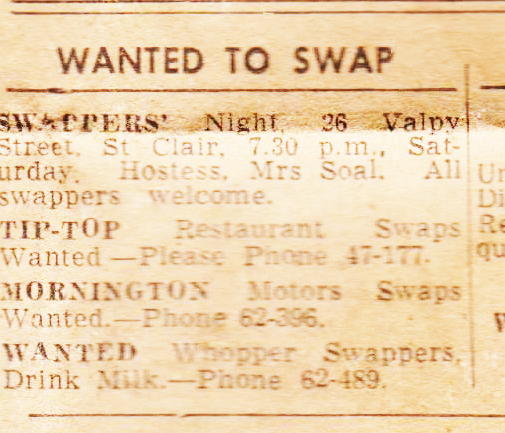 This is a set of coupons from the “Swoppers” competition, published in Christchurch in 1957 (Possibly this is “The Big Y Swopper” mentioned earlier). This set again has some repeat designs of others, proving that all the competitions were somehow linked, but what exactly the common factor associating them was, apart for the obvious fundraising/charity aspect- I am not sure. However this set is more focussed on local business but does showcase a few household products. The only exception is the Forestry Service “Keep New Zealand Green” coupon which is yet another missing one from my “Big Swap” set at the top of the article. I just placed it in the middle of the “Swoppers” set to keep things kind of tidy. I wonder how many others there are that I don’t know about? And how many other competitions there were around the country during that period? Like the “Jaycee Swap’em” coupons, I’ve never seen another example of the “Swoppers.” Whereas, more regularly “Big Swap” coupons come up for auction, and by “regularly” I actually mean about once a year or so (but rarely a full set). All following images are courtesy of Owain Morris collection. Addendum mid June 2015: Evidence that people were actively swapping in an organised manner, to complete collections. This clipping from the Otago Dunedin Times, December 1 1973. Image courtesy of Owain Morris collection. I’ve recreated these Sunshine jelly crystal boxes in all six flavours that were in the range of the time (with a small amount of artistic license on a couple of the colour schemes) from images a couple of collectors have uploaded to Flickr over the last year or so. Once the second lot had appeared online, I became interested to know how more than two enthusiasts managed to get mint condition flat boxes for the same product, seemingly around the same time. Although it should be noted that the premium cards were cut out of the packaging and collected – the boxes were still retained by someone. For what reason they, presumably a child -would have kept them afterwards, if not for scrap-booking – I can’t imagine. Anyway what were the chances that a whole bunch of them should turn up at the same time? Unlikely. Apparently these were for sale on Ebay Australia around five to six years ago, as far as one of the buyers remembers. Apart from that I don’t really know anything of the provenance, and why items from a New Zealand brand were being offered outside of the country. Having that background information can tell you a lot about a company and its products over time, such as was the previous owner an employee? Or maybe just a pack rat? Either way, it’s usually worth trying to follow up and see what one can find out because you never know where it will lead you next. They may look like they date from the late 1950s-early 1960s era; but apparently these actually date from the early seventies, around 1971 (noting imperial is still used in the design, they would definitely be from before 1972). I’ve already previously discussed my thoughts on this very subject and how The Land of the Long White Shroud, as I like to call it, was lagging behind in the post WWII years. Things were a bit old-fashioned to say the least and the Kiwis remained very much tied to Mother England’s apron strings, whereas Australia embraced US-style popular culture in a much bigger way. That said, this design was very “American” in its approach, I think. Kiwiana enthusiast Steve Williams says: “They were a bit behind the times as most of these pictures on the cards are from Project Gemini, and they even include a picture of Ed White who spacewalked in 1965 and died in the Apollo 1 fire of 1967″. In the meantime I’ve gathered a lot more information as well as images but they will have to be for the future post, when I recap on the brand. 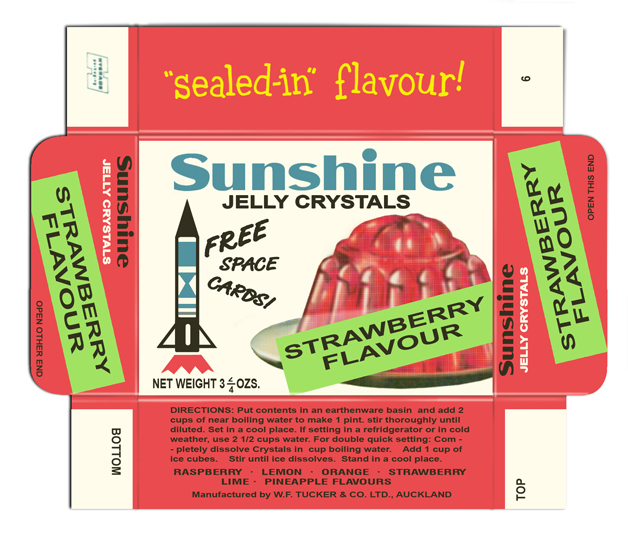 I recreated this Sunshine jelly crystals box below quite a while back but haven’t had enough time to post it, along with quite a lot of other stuff that is backed up including a 1971 set of boxes in six different flavours. Although Tucker were around for a long time, they started using “New Zealand Sunshine ” in the late 1900s as a slogan in conjunction with the company name, then dispensed with everything else around 1926-1927 when they segued into the Sunshine brand as a stand-alone name. 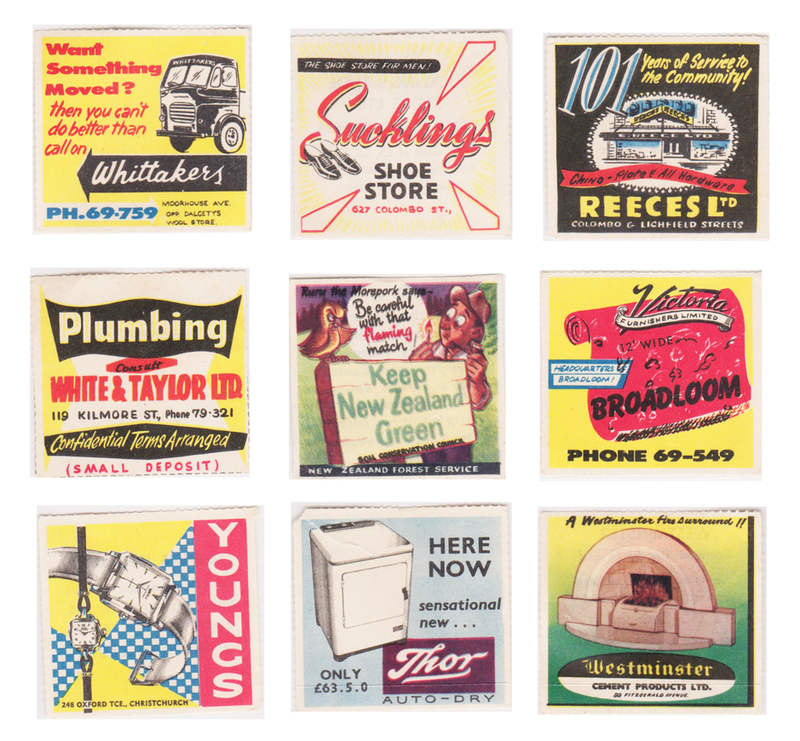 Trademark registry tells me this design dates from 1951 and it was still being used on these coupons for The Big Swap competition* in 1954 – although they overhauled the packaging with regularity throughout the brand’s life span and changed it up every few years. I have pictures of other designs that date from the 1940s and I am looking forward to breathing the life back into them eventually. I made this design from a very grainy, low resolution photocopy from the IPONZ archive which I had stashed for a long time, until I came across a colour picture included in the coupons below and thus had all the references and motivation I needed to bring it back to life. Definitely plenty more to come on the Sunshine brand before the end of the year. 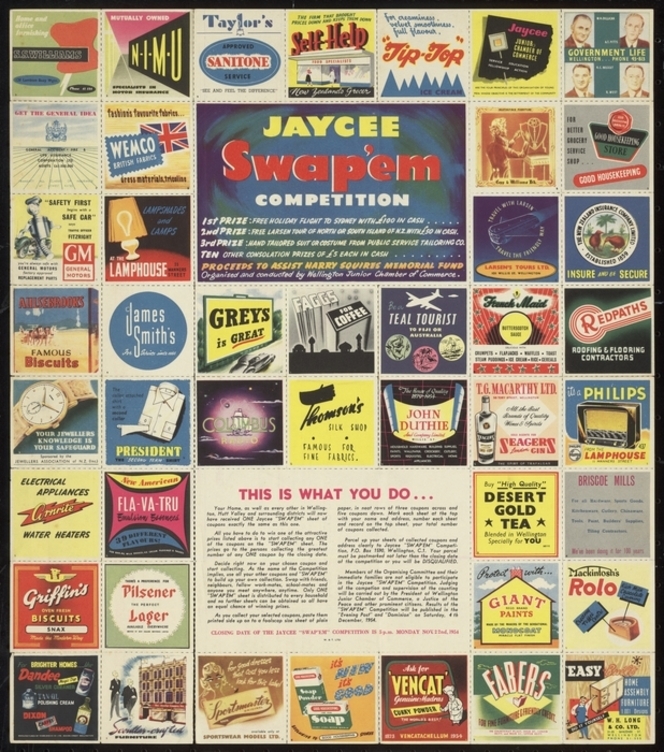 * The Big Swap competition colour coupons from 1954. I don’t know the details of what it was exactly; the ad is digitised in the Alexander Turnbull pictorial collection but the print is too fine to read. I assume the coupons were published in various magazines and booklets, you had to collect the set (there appear to have been about 30 different designs), swapping if need be to get a full set- to qualify for entry in the cash prize. Occasionally they come up for auction, about once a year or so; but rarely a full set for obvious reasons. Mike Davidson is one of the better known Kiwiana collectors around or rather, he is one of the handful that choose to be known. As such, he actually shares his passion for collecting the genre with others . His moniker on Flickr is Kiwigame and you can see some of his collection of here. He also has a fairly extensive collection of New Zealand tumblers, specifically the ones that were printed with ceramic designs. 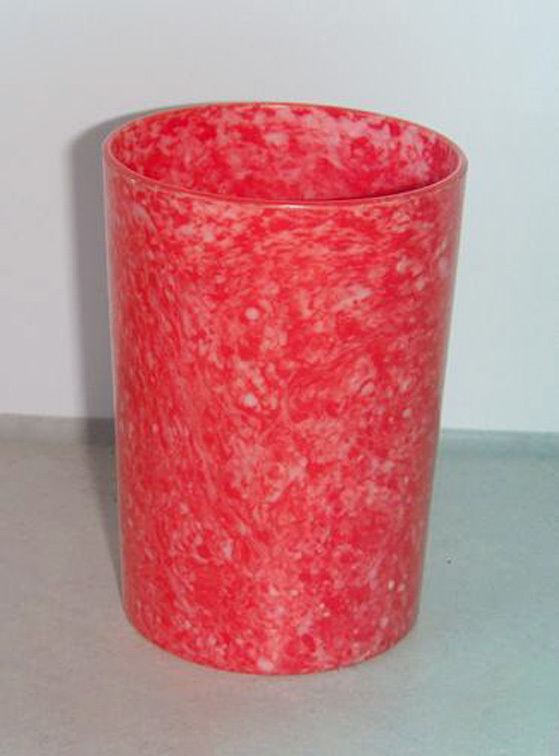 Prior to the early 1950s, perhaps as far back as the thirties there were some tumblers produced by Sanitarium and Kraft, in colourful speckled Bakelite or plastic. They were seemingly an identical shape, bar the imprint on the base denoting the company. From then onwards these glasses were produced, mostly by Christchurch’s Crown Crystal Glass for Sanitarium, Chesdale, Kraft, Airborne Honey and Sunshine. 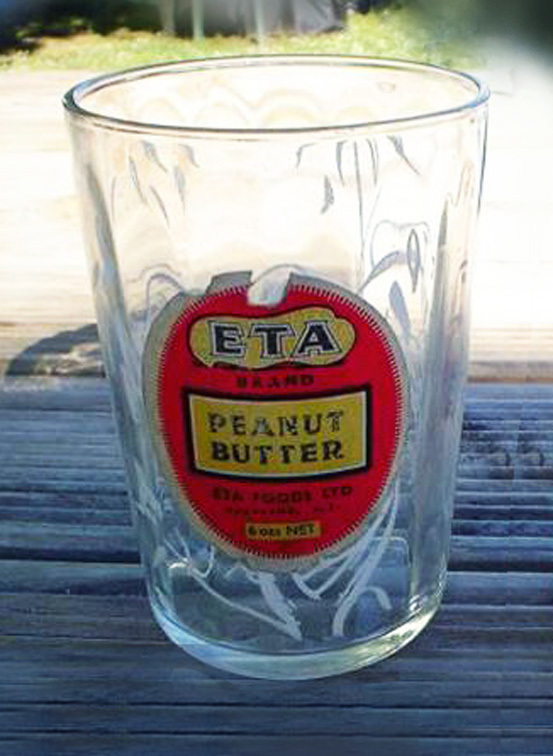 Filled with product, often peanut butter, preserves and honey, they were to be reused, when the jar of whatever was in it – was finished. Like so many accompanying gimmicks, they were issued in collectable sets to promote sales of the brand. I do recall some of these from my childhood; I remember some of the Sanitarium bamboo designs in my grandparents’ cupboards. But I am sure that every house in the country had at least a couple so saying I remember them is stating the rather obvious; so ubiquitous were they. Although clearly many more products than the few companies featured here produced glasses for popular and much loved Kiwi brands, Mike has focussed on the specifically New Zealand-founded companies. As it turns out the tumbler above ended up in Mike’s collection at auction close and he says “I found it interesting as it has “Auckland NZ” printed on the label. Before I found this one it was assumed this series of glasses were completely Australian in origin due to the design on the glass being of Koala Bears and Australia having a long history of these glasses”. were the main ones, and also McLaren’s which I know nothing about and may have been imported. I have ads for ETA from the 60s on. 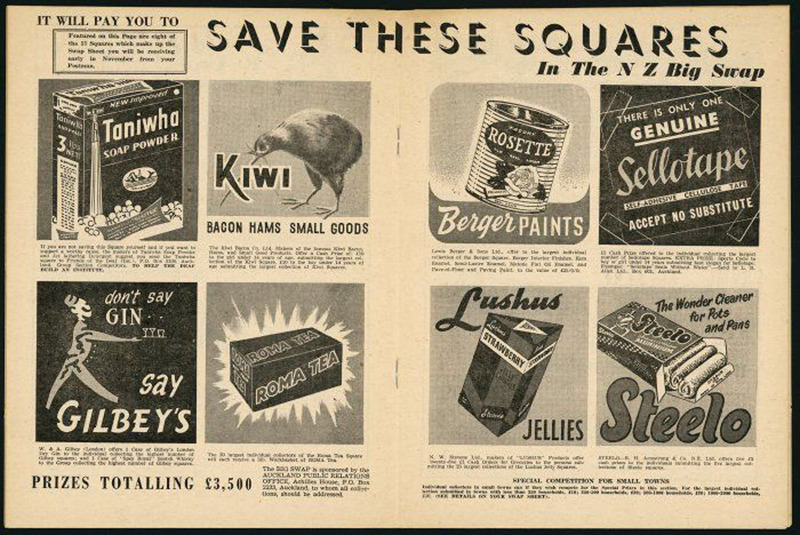 Definitely by the time I was young in the early 1970s they had a huge and well-advertised range of products in NZ. 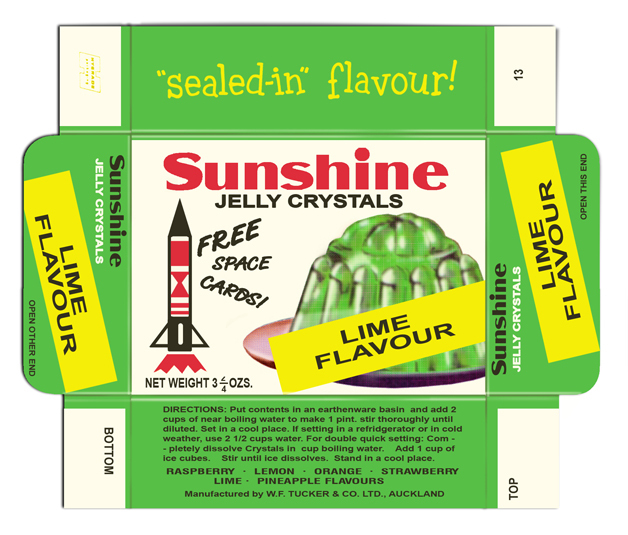 Occasionally at IPONZ they will actually post a grainy, low quality scan of the product packaging which has been trademarked, and that is where I grabbed this from and recreated it from scratch. Sunshine was a long established brand by W.F. Tucker and Co., Ltd, based in Grafton, Auckland. 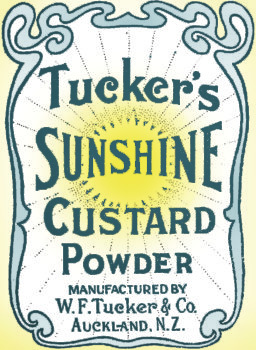 I’ve found advertisements going back to the mid 1890s for their baking and custard powders under “Tucker’s” – although it took a good twenty or more years for the “Sunshine” brand to gradually come into its own. 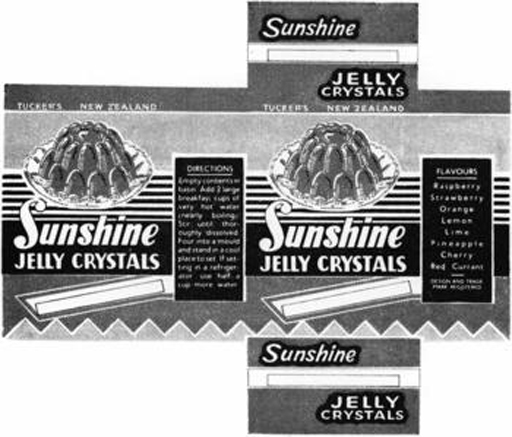 By the early 1900s they are manufacturing jelly crystals, which is what most people remember them for. 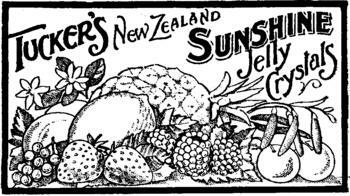 Amongst the fourteen delicious jelly flavours on offer from Sunshine by 1917 were “Champagne” as well as “Calves Feet” (ew! I guess aspic meals were all the rage at the time) and their 1919 announcement of their kidney flavour soup declares it a “masterpiece of flavour” (the jury is still out on that one). By the late teens a serious product expansion was underway and instant milk puddings and soups were added as well as the twee “Fairy”, “Splendo”, and “Elfin” desserts. Eventually by the 1960s they had branched into instant rice and pasta-based meals, cereals, drinks, canned goods, dressings and spreads – with varying success. Sometime In the mid 1970s Tucker was sold to Bluebird Foods and in turn passed to Goodman Fielder, of which Bluebird was probably already a division. Trademark records from 1974 show that classes of products were split across two companies. 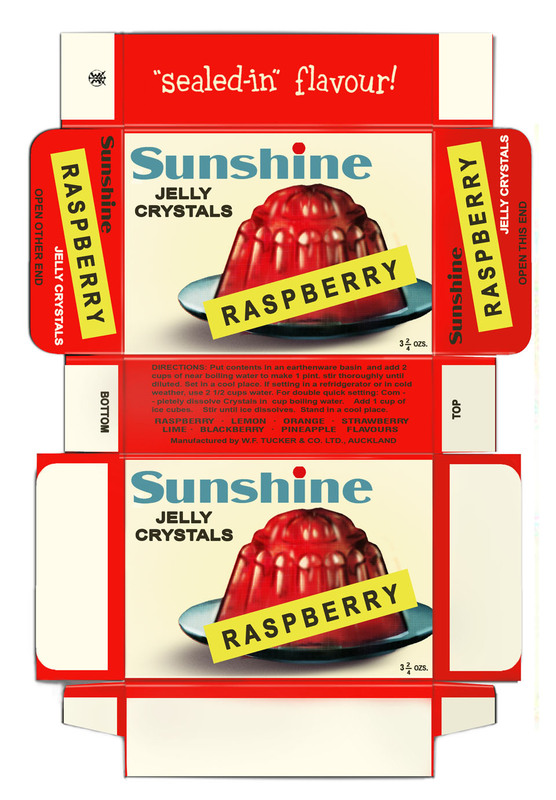 Most people think of “Sunshine” and remember a wobbly gelatin confection on the dessert menu. 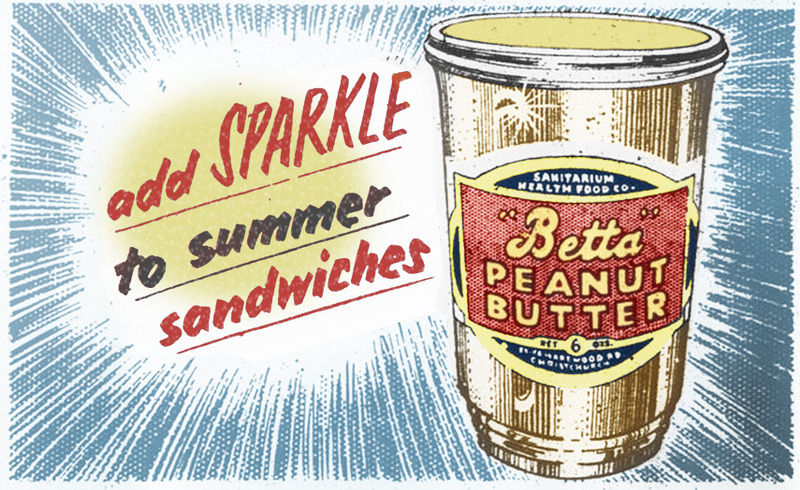 Baby Boomers will also recall their well-known peanut butter. 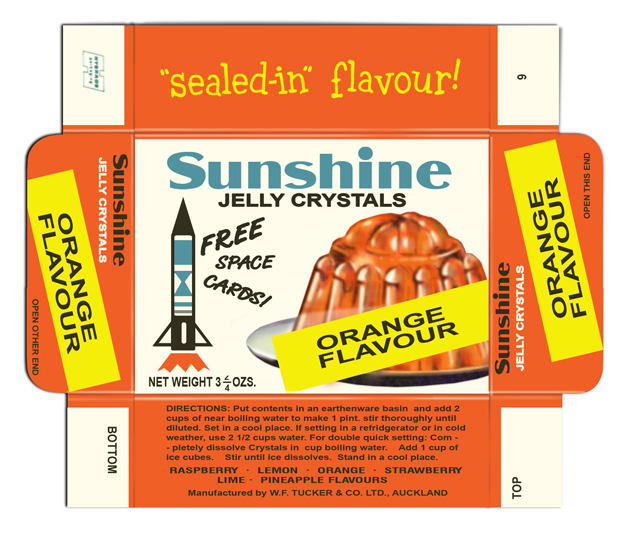 We were mainly a “Greggs” household so I don’t remember “Sunshine” other than for their boxed risotto and milk powder. I was under the assumption that the brand still existed in at least instant rice meals but it seems it is now defunct. 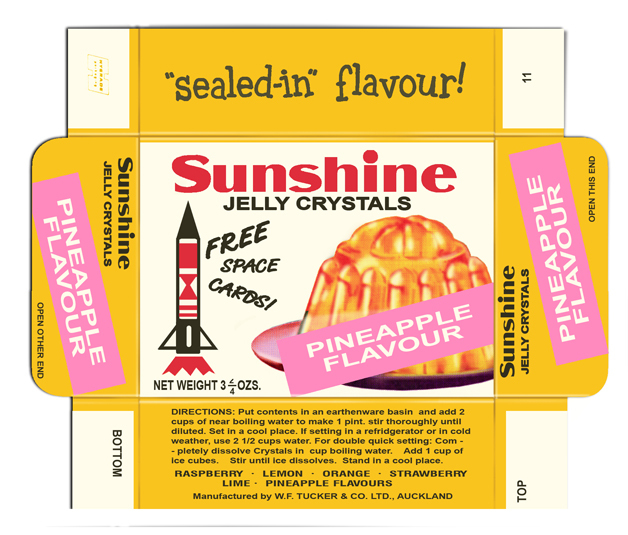 I’ve got a lot more stuff on “Sunshine” so you can look forward to a couple more posts of packaging recreations in the future.